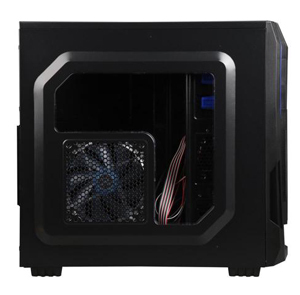 A practical yet stylish gaming case, the DIYPC Ranger-R5-B offers all features that DIY builders value the most at a good price point, including roomy internal space, impressive cooling capacity, advanced bottom-mounted PSU design, cable management design and more. The stylish aesthetic design with highly arresting black/blue color makes a bold statement anywhere you place the case. 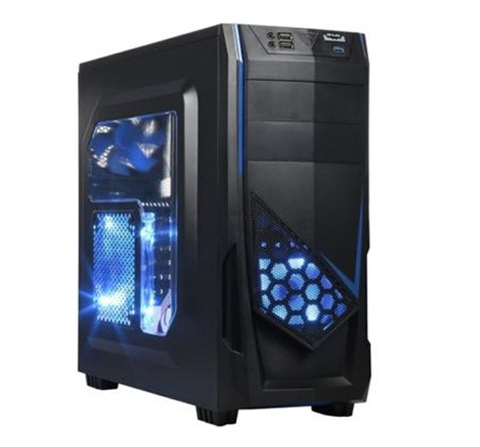 The built-in blue LED fans emit very bright blue light for an attractive inner look. You can clearly see the entire build unrestricted through the large transparent side panel window. Take one home today and build yourself the "coolest" rig around. 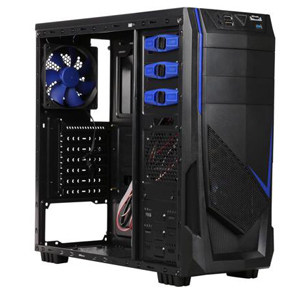 The DIYPC Ranger-R5-B case supports up to four blue LED fans for optimum cooling performance. One 120mm fan is cleverly preinstalled on the side panel. Two 120mm fans are mounted respectively on the front and rear panels. 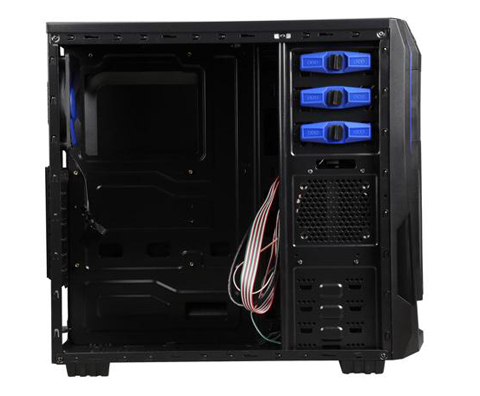 Optional fan slot on the top panel allows you to install one additional 120mm fans. 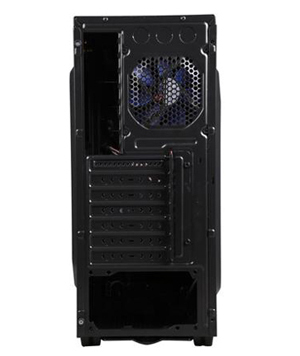 In addition to support for a Micro ATX or ATX motherboard, the DIYPC Ranger-R5-B case can accommodate graphics card of up to 420 mm in length, and CPU cooler of up to 160 mm in height. Up to seven PCI slots provide flexibility for multiple graphics cards solutions. 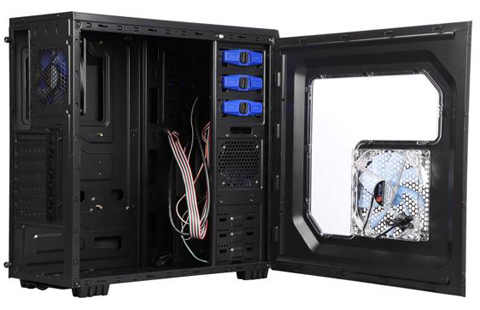 The DIYPC Ranger-R5-B case offers the perfect level of expandability you desire. It features multiple hard drive bays to support a total of four internal 3.5” hard drives and two 2.5” SSDs for a massive storage potential. It’ also furnished with two 5.25" external drive bays to fit 5.25” optical drives. The screw-less design for 5.25" devices and 3.5" HDDs makes swapping drives a snap. The front panel I/O panel offers one SuperSpeed USB3.0 ports for up-to-date high speed data transfer, two USB 2.0 port and HD audio In/Out jacks. The advanced bottom-mounted PSU design enables independent and optimized PSU cooling. The cable management design helps manage cables in your chassis to create neat inner look and enhanced, smooth airflow. 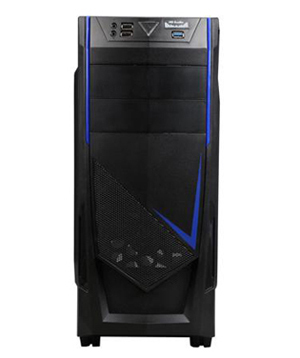 The front panel dust-proof mesh design keeps your computer clean and protected from dust. The modern aesthetic design with a highly attractive black/blue color scheme provides an out of the ordinary look that will look great anywhere. The blue LED fans illuminate the whole system and create a stunning atmosphere. Through the oversized transparent side panel window, onlookers can clearly see the guts of the PC. 18.72" x 8.00" x 17.00"